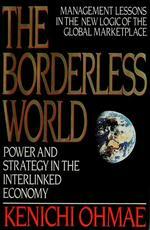 Since 1990, when it was first published, The Borderless World has changed the way managers view the world and their businesses, and how they invent, marker, and compete in our new globally interlinked economy. Kenichi Ohmae's groundbreaking bestseller argues persuasively how national borders are less relevant than ever before and identifies key characteristics of top--performing nations and corporations. In this revised, updated edition, which features a new introduction by the author, Ohmae attributes the American economy of the 1990s to its seamless entry into the borderless world and looks forward toward an uncharted future. He casts a critical, though ultimately hopeful, eye on the financial crisis in Asia and especially in his home country of Japan.